Abstract: AMD have incorporated an extra 256KB of L2 cache on the core, thus giving it a grand total of 512KB L2 cache. 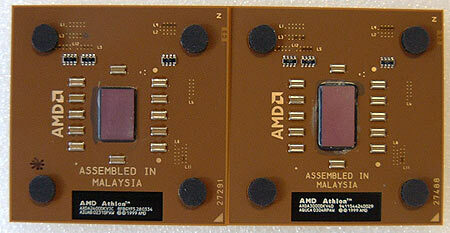 In the latter half of 2002 all AMD could talk about was their 64-bit processor, code named "Hammer." With all the Hammer this and Hammer that, you'd think that it was the next best thing after sliced bread! Unfortunately for them things did not pan out as they had hoped and Hammer... well let's just say we're still waiting for it. Today we'll be testing out AMD's new AthlonXP 3000+ processor which is based on the new Barton core. This the last revision for the fan favorite K7 Athlon and is a holdover till the K8 Athlon64 is released. Unlike the transition from the Palomino core (0.18 micron) to the Thoroughbred (0.13 micron) which was simply a die shrink, AMD has added something new to the mix this time around. They have incorporated an extra 256KB of L2 cache into the core, thus giving it a grand total of 512 KB L2 cache. In the past we have seen that when a processor doubles the amount of L2 cache, performance clock for clock usually increases by around 10%. In the picture below you can see the Thoroughbred core on the left, and the Barton core on the right. 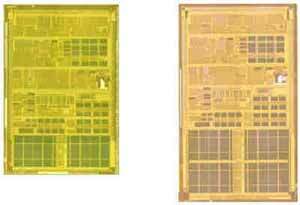 As you can see the AthlonXP 3000+ die is physically larger and that's is all due the doubling of L2. The total transistor count has also increased by around 30%, from 37.6 million present in the Thoroughbred to 54.3 million in the Barton core. Albeit, both cores are still a smaller than Intel's Northwood Pentium 4 which weighs in at a 55 million transistors. The AthlonXP 3000+ "Barton" processor we tested was based on the AQUCA stepping, and was manufactured sometime in week 04 of 2003, literally hot off the presses! The AthlonXP 3000+ runs on a 333 MHz FSB with a default voltage of 1.65V, just like the other 333 MHz chips. Other than the larger L2, there are no architectural differences between Thoroughbred B's and Barton chips. The Thoroughbred core is on the left with 256KB L2 cache and the Barton core is on the right with 512KB L2 Cache. Both processor cores have a total of 128KB L1 cache. Previous limited release [paper] processor launches were severely criticized by consumer left, right and center. This time around, both Barton based AthlonXP 2800+ and AthlonXP 3000+ are available immediately. AMD is to release a "budget" AthlonXP 2500+ Barton at the end of Q1 2003. As you might have noticed, the top of the line AthlonXP processors are no longer as cheap as they once were with previous releases. The reason behind this is, AMD is trying to get price parity for their chips similarly priced high end Intel Pentium 4's. Currently the AthlonXP 3000+ has a MSRP of $588 US which is pretty close to the retail price of the Intel Pentium 4 3.06 GHz at $617 US. Either way you swing it that's a big chunk of change; and I hope this can bring AMD out of the red after their recent downsize to the tune of near $1 Billion USD. While Athlon64 (Hammer) motherboards have been ready since November 2002, the processors themselves are only scheduled to be released sometime in September 2003. AMD users better get use to the Barton because we still have quite a wait quite a bit! All current 333 MHz capable Socket A chipsets (VIA KT333, KT400, nVIDIA nForce2, SiS 746FX) should be compatible with Barton based processors although you may need to flash the BIOS for the processor to be recognized properly. For those PCstats.com readers with older 133 MHz based motherboards (VIA KT133A, KT266, KT266A, AMD 760, SiS735, 745, nVIDIA nForce) the chipsets do support the Barton core (not 333 MHz), but it will be up to the manufacturers if they want to give support for the processor or not. Bottom line, today might be a good day to upgrade you BIOS if the AthlonXP 3000+ is in your sights. Pg 2. Overclocking, you know you love it! Pg 8. AMD comes back with a vengeance!